Procurator of Judea after the death of Agrippa I. Appointed by Emperor Claudius in 44 C.E., he went to Palestine in the same year, and found the inhabitants of Peræa engaged in open hostilities against those of Philadelphia on account of boundary disputes. Fadus soon restored order, but he then incensed the Jews by the unreasonable demand that the sacred vestments of the high priest, which had been in the hands of the Romans from the year 6 to 36 C.E., but had been restored to the Jews by Vitellius, should again be given into the keeping of the Romans. With the consent of Fadus and the Syrian governor Cassius Longinus, the Jews sent an embassy to Rome, which obtained from Emperor Claudius the revocation of the procurator's demand. 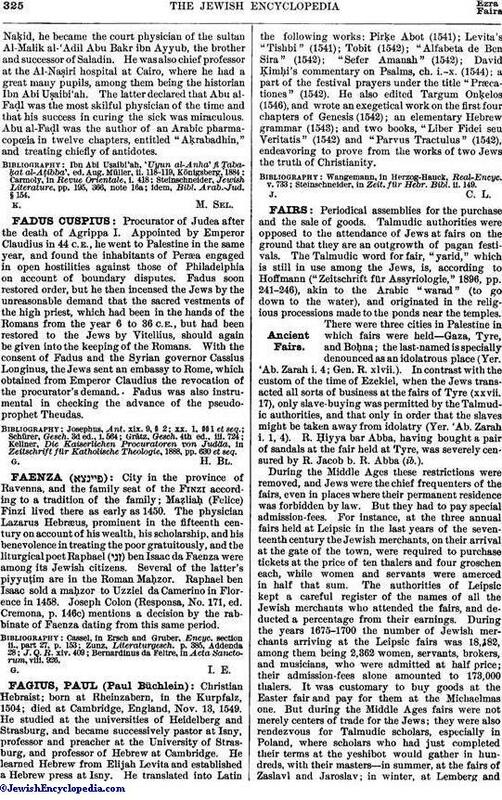 Fadus was also instrumental in checking the advance of the pseudoprophet Theudas. Kellner, Die Kaiserlichen Procuratoren von Judäa, in Zeitschrift für Katholische Theologie, 1888, pp. 630 et seq.